Cooking Italian . . . . . I said in my last column, two weeks ago, I am going to share some of my favourite Italian dishes with you over the next few weeks. Talk about unusual ingredients all you like, boast about complicated dishes if you will, chat about the latest foodie craze at your peril . . . for me there is no substitute for good solid, ingredients well prepared into the simplest of dishes. For me no one does that better than the Italians . . . well okay maybe the Chinese and Japanese are well up there too, but lets not split hairs. Italy is where I learnt how to make 'instant soups', but not of the packet variety I hasten to add. If you have a blender or food processor this soup should take not much longer to prepare and cook than the time it takes to heat a tinned or packet soup and of course you are guaranteed freshness. Like me there will be times when you have needed to knock up a quick soup. Well unlike the classical French recipes that have endless amounts of unnecessary ingredients, prolonged cooking times and intricate methods, the Italians have long been making quick and easy soups. With its fresh ingredients and short cooking time, these are not only very nutritious but also possess a wonderful freshness of flavour. 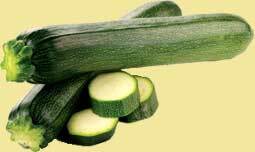 I am using courgettes, but it works equally well with marrow or cucumber also. But why limit yourself there? Apply the same preparation and cooking method as below and throw away all those prolonged cooking time soup recipes and make them the fresh way . . . you might just need to cook the soup a little longer for root vegetables like carrots or blanch and refresh leaf vegetables like spinach first. Pour into bowls and serve with grated / shaved cheese on top: cheddar, parmesan, pecorino, etc.